Excerpt from The Philosophy of Cognitive-Behavioural Therapy (2010), copyright © Donald Robertson. All rights reserved. Lead me wherever your laws assign me. Wretched though I may be, I shall follow still. Fate guides the willing, but drags the unwilling with it. – The Hymn to Zeus, Cleanthes of Assos. 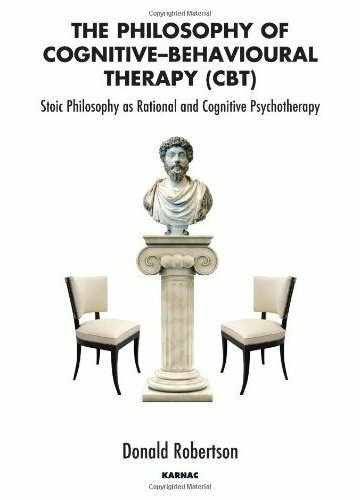 I hope to have shown that the origins of psychotherapy and self-help, especially of a cognitive orientation, can quite reasonably be traced to classical philosophical schools such as Stoicism. I think the reader will also perceive that the philosophical tradition contains a number of concepts, strategies, and techniques, which might expand the clinical armamentarium of modern psychotherapy, providing new means of facilitating cognitive, behavioural, and emotional improvement in today’s clients. The enormous literary and philosophical value of classical texts, such as the writings of Seneca or Marcus Aurelius, add another dimension to the study of psychotherapy for those drawn to the beauty of thought and expression in ancient literature. These works have survived many centuries, and certain individuals in one generation after another have been drawn to them for both consolation and inspiration. The life stories of these philosophers too are often remarkable. Seneca? Epictetus? Marcus Aurelius? Our knowledge of their character and circumstances, and times in which they lived, undoubtedly adds something to our appreciation of their wisdom when it comes to coping with adversity in all its hues. These were intellectual heroes, veritable warriors of the psyche, who knew bereavement, torture, exile, infirmity, warfare, political intrigue, and betrayal, and who were responsible for the care of others facing similar circumstances. Vice Admiral Stockdale, the Vietnam veteran, is perhaps our closest modern equivalent. He described the ancient world of Epictetus as a dangerous “buzz saw” of adversity and misfortune, and he found himself against a similar metaphorical buzz saw in the dungeons of the Hanoi Hilton prison, where he almost gave his life to avoid betraying the incarcerated soldiers under his command. I make no pretence to be a classical scholar myself, just one who happens to be well-positioned to comment on the overlap between the two disciplines of classical scholarship and modern psychotherapy. However, I hope to have been able to provide a little more scaffolding within which others may erect a more comprehensive and refined account of modern psychotherapy within the Socratic tradition, inspired by Stoicism and other ancient therapeutic approaches. My grasp of ancient languages is quite limited but where necessary I have modified the existing translations, or produced hybrids of them, which seemed to me to better convey their technical meaning to modern readers, especially psychotherapists. Where possible, I’ve tried to check my translations with others more adept in these matters. Undoubtedly, one of the greatest obstacles to the reception of ancient texts among modern professionals engaged in similar work is due to the language used in common translations, which are often quite anachronistic themselves. I would like to think that one day translations could be made of key texts, such as the Enchiridion, using the same terminology used by modern psychotherapists, where appropriate. Perhaps most crucially, I would suggest that the term “emotional disturbance” better and more accurately conveys the meaning of pathé to modern practitioners of psychotherapy than the conventional translation as “passion.” The false notion of the Stoic as a “cold fish”, someone “intellectualising” or “rationalising” things defensively, at the expense of feeling, has done more to deter modern readers than any other misconception. This could be redressed, perhaps, by emphasising the opposite view and formulating an explicit account of Stoicism, as previously discussed, which centres upon its theory of the ideal Sage as being animated by a philosophical love of existence; free from passion, in the sense of emotional disturbance, but nevertheless full of love, as Marcus Aurelius put it. The analogy with Spinoza’s “intellectual love of God”, or Nature, might perhaps act as a guide in this respect. Spinoza himself presents a system of philosophical therapeutics so similar to Stoicism that it is tempting to see him as their true modern heir in this respect. To further assist the reader, I have provided the script of an exercise called the “View from Above” which can easily be read to groups of students, and which I hope provides some taste of the kind of mental exercise that Socrates or Epictetus might have approved of. We have used this script with hundreds of people over the years, and consistently found that they enjoyed the experience and appeared to obtain some benefit from it. We have also experimented with audio recordings of the same script, on CD or MP3, which clients appeared to find helpful. Some people find these exercises so appealing that they repeat them on a daily basis. Indeed, I have also attempted to provide a schematic reconstruction of the daily regime or routine of a Stoic philosopher, to try to help modern readers better envisage their use of the various exercises discussed. This cannot be a perfect reconstruction, but clear support for it can be found in the preceding chapters, and I hope that it will make the overall “art of living” clearer, as well as highlighting the kind of self-discipline apparently required to follow the Stoic path. In conclusion, I hope that this work can be extended to form the basis of a more coherent appraisal and assimilation of classical philosophy within the field of modern psychotherapy. I intend –fate willing as the Stoics might say– to continue to publish my own research in this area. However, this initial effort will have served its purpose if it draws others to the subject and brings forth further contributions from other psychotherapists who see something of value in the philosophical literature. I have found the literature of classical philosophy to be of tremendous personal value, and have also drawn inspiration from it in teaching, supervision, and clinical psychotherapy. I am certain that others will benefit from it in similar ways and if this book inspires them to read Seneca, Epictetus, Marcus Aurelius, or other ancient philosophers, then I will be satisfied that it has achieved something indisputably worthwhile. Previous Previous post: How would the ancient Stoics have dealt with hate speech? Next Next post: Stoic Week 2016 Starts Monday!